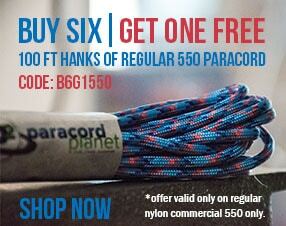 Right now, at our Paracord Planet headquarters in Fargo, North Dakota, it's 39 degrees with a high of 62 for the day. This is much warmer than usual (personally, I love it). On March 11th, the average temperature is 33 degrees. We passed that before 9am this morning. Mother nature is about 2 months ahead of schedule, and I'm not complaining. I don't know about you, but warmer weather gets me very excited for spring and summer. I think about all the bon fires, camping, fishing, grilling, and floating down the river. Naturally, this excitement calls for a warm weather post. So here are 3 paracord items to keep in your tackle box. 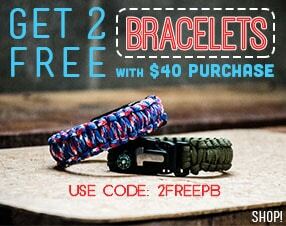 Why not combine your love of paracord with your love of the great outdoors! A paracord fishing stringer is so easy to make and use and a great thing to have with you while you're fishing. The great thing about these stringers is that if you tie it off your boat they aren't metal so when it hits the side of your boat, it won't make noise and scare your fish away! These were designed for river fishing, shore fishing, and wade or shallow water fishing. They can be relatively inexpensive to make and can be done with any color making them personalized for your taste. Paracord Planet carries 12 different colors. The paracord fishing lure is one you can make out of a mere 2 inches of scrap paracord, a hook, and a few inches of fishing line! This is such an inexpensive and fun way to use up extra paracord and have some fun colorful lures. A paracord fishing line is another great way to use paracord for fishing. This is one that you should know for a survival situation (as well as a fun way to fish) because what if you run out of food or get stranded in the wilderness? Unfortunately, you just never know what will happen and it's always best to be prepared. This could also be used as a great lesson or fun adventure with your kid while you're out camping. Learn how to make your own paracord fishing line here.